In Auckland, this stunning Whale’s Tail is the result of a wonderful week of activity led by joined forces of Jacquline Smith of the Volvo Ocean Race management and Skeleton Sea artist Joao Parrinha at the Volvo Ocean Race Stopover recently. It all began by the Team New Zealand base, where artist João Parrinha created the base of a new art piece yet to be created from old pieces of metal. Then, a beach clean was held on Motuihe Island with the knowledge and help of the charming Ranger, John Mills. Around 40 people from all over the world joined the clean-up effort, ranging in age from 2.5 years to the mid sixties! Lighters, bottle tops and small pieces of plastic of all colours and descriptions were collected, then sorted and cleaned for the Art Workshops. 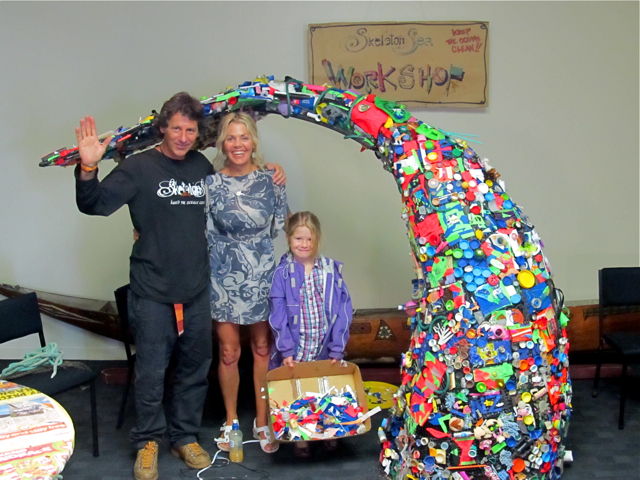 Children from all over Auckland have helped to decorate it – making individual mosaics with the rubbish that João has attached to the base to create a colourful, unique sculpture. Here it will stay at the Voyager Museum, where the Art Workshops were kindly hosted. It serves as a reminder of the importance of keeping the oceans clean! In each of the ten Volvo Ocean Race Stopovers, a community beach clean is organised to contribute to ‘keeping the oceans clean’ in the local context, and a series of art workshops are held to transform the rubbish collected into a unique sculpture; a creative example of turning ‘trash into treasure’ with the help of the Skeleton Sea artists.